Ettore Facchinetti, 60, was detained in the town of Caldes de Montbuy near Barcelona, a police spokeswoman told AFP. "He is accused of coordinating in Spain a network that smuggled cocaine to Italy," she said.Facchinetti, a suspected member of 'Ndrangheta, the Calabrian mafia, was sentenced to 15 years in jail in Italy for drugs trafficking and was the subject of a European arrest warrant.Since 2006 more than a dozen leaders of the Camorra and other Italian mafia groups have been arrested in Spain, the main entryway into Europe for cocaine from Latin America and hashish from North Africa.Last week Spanish police said they had detained a suspected leader of a Calabrian mafia, who was once a security guard for an Italian government minister, in the southern port of Marbella.Italian journalist Roberto Saviano, the author of Gomorra, a best-selling expose of the criminal underworld in Naples, has said several mafia clans have transferred what he termed "their most risky activities," such as drug-running, to Spain, particularly to Barcelona. 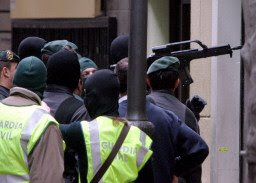 Speaking in Barcelona earlier in February, he said Camorra bosses refer to the Spain's Mediterranean coast as "Costa Nostra" or "our coast", alluding to the Sicilian mafia's "Cosa Nostra".